Bethlehem House of Bread (BHOB) provides free food to nearly 200 hungry families per month. At a time when 1 in 5 Oregonians are food insecure, BHOB fills an important need in the community by making sure fewer of our neighbors go to bed hungry. In operation for almost four years, BHOB is a ministry of Tigard United Methodist Church and has a mission to feed those who are hungry in body and spirit at a table where all are welcome. BHOB meets its mission in a variety of ways, foremost of which is through the operation of a food pantry that is open twice weekly (1-3 pm on Sundays and Thursdays) where anyone who is food insecure can shop for free once a month. If you’ve never been inside a food pantry, BHOB doesn’t look much different than a typical grocery store, just on a smaller scale. With the assistance of friendly volunteers, guests go through the pantry choosing items that meet the dietary needs and preferences of their families. With an eye toward healthy food, BHOB’s pantry shelves are stocked with many of the same products and staples you would find at a store. Recipes with products from the pantry are available to encourage healthy choices. An onsite community garden replicates a farm-to-table model and provides shoppers with access to wholesome and fresh produce. Depending on the season, it’s not uncommon for visitors to leave with acorn squash, vine-ripe tomatoes, crisp lettuce, or pungent herbs, among other veggies. Fruit from our community partners and local farmers complements the bounty. BHOB goes beyond what you may find at other food pantries by offering free gardening and cooking classes for youth and adults, weekend backpack program through a partnership with Metzger Elementary, weekly walking group, and a free onsite store stocked with clothing and other household essentials. The community garden with 24 raised beds is an inspired way to become a backyard gardener (available for rent at $35 for the season). 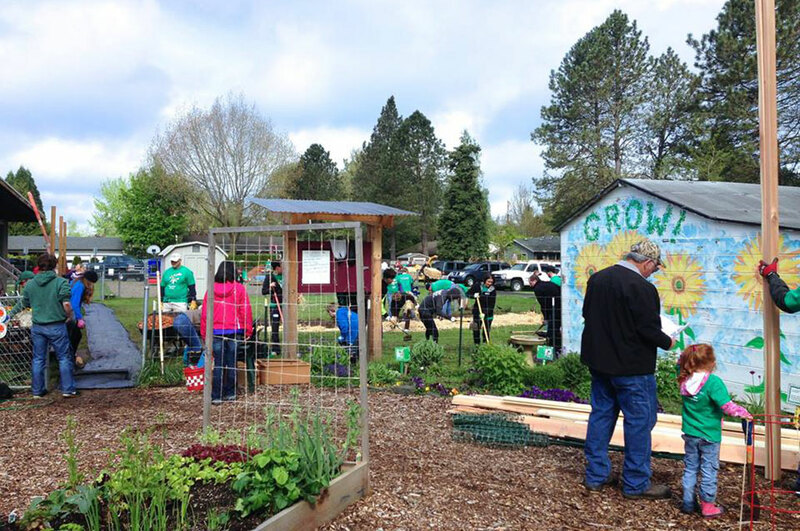 At the heart of it, BHOB is about building a healthy and connected community—a healthier Tigard. And BHOB has bold plans for sustained impact while creating something very special. A fundraising campaign is underway to help with a large kitchen remodel. As a regular volunteer, I see firsthand the difference the services make for our neighbors, and I’m incredibly proud to be a part of the efforts to fight hunger locally. There are many ways to get involved at BHOB—from assisting in the food pantry, helping with fundraising efforts, and clerical support to grounds maintenance, or teaching a class. BHOB relies on the generous support of volunteers, donations, and community partners such as the Oregon Food Bank, Good Neighborhood Center, and Supa Fresh Youth Farm. We’re always ready to collaborate with local businesses on employee food drives or other special projects. If you or someone you know can benefit from BHOB visit us during our pantry hours. To get involved or volunteer, contact Linda Dove at bethlehemhouseofbread@gmail.com or 503-639-3181, ext. 1. For additional information or to make an online donation, go to bethlehemhouseofbread.org. BHOB is located at 9055 SW Locust St., Tigard.